The Bureau of Land Management (BLM) in Colorado has the following suggestions for determining whether it’s safe to bring infants and small children on the Delores River in Colorado. The Delores is a springtime river, with cold water and spring’s unpredictable weather. Can your child climb in & out of a boat by himself/herself? Is your child strong enough to hold himself/herself in a moving or bouncing boat without being held by a parent? Does your child have the knowledge, strength and skill to get to shore or back to a boat if he/she has fallen overboard? Does your child have the knowledge, strength & skill to survive a swim in cold, moving water or rapids? Nicholas reefing on the oars. The conditions on the waters where you plan to take your kids may differ from those on the Delores. However, consider the worst-case scenario that you could face on your trip and ask yourself, “Can my little ones take care of themselves if this happens?” Sound advice for any moving water boating is “Dress for a swim, rig for a flip.” Remember, you may or may not be able to assist your children if an accident occurs. Ensure their safety and enjoyment of your trip by preparing them to react to emergencies. Here are some ways to do this. Also check out the “Kids Safety” article for more tips. We stock Kids’ PFDs to fit most body types. Make sure your kids have one that has the right amount of flotation for their weight and one that fits properly. Remember, these young people have growing bodies and will probably require larger sized jackets over time. Do not buy a larger jacket they can “grow into”—that’s not safe. Make sure the PFD fits properly. Tighten all the adjustment points snugly, starting at the lowest one. Then, pick the child up by the shoulders of the jacket. If the child’s chin and ears slip through, the PFD is too large for them, replace it with the right size. Comfort in a PFD is important with a child; if their jacket isn’t comfortable, they’ll resist wearing it. You may have to try more than one to get a good fit. A PFD only works if you’re wearing it! 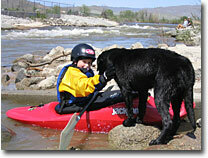 Make sure your child is wearing their properly adjusted PFD at all times while on or in the water. Set a good example by always wearing yours. It’s also a good idea to have them wear the PFD in camp when playing near the water. for one of us in this boat!" Help your child become comfortable with boating and with water. Make sure they learn to swim. Go out with them and float through some mild rapids. Explain the safe way to do it—on the back with feet downstream. Talk about breathing in the wave troughs and holding their breath when they get splashed. Hold their hand and float through some waves together. Make it a game and a fun activity. Talk to them afterward, find out if they have any fears and answer all their questions. Go to a stretch of moving, flat water and practice having them catch a throw rope and get pulled to shore. Again, make a game out of it and help them be comfortable with the process. While you’re drifting along, let them float near the boat in safe stretches. Let them swim to the boat and practice climbing or being pulled into the boat. Start out slow and let your child set the pace. It’s important not to scare them and for them not to have a bad experience. As they learn these skills, their confidence will grow and you will be more comfortable taking them with you on trips. Little bodies get cold. See our Kids Gear for wetsuits and splash wear. NRS HydroSilk long and short sleeve shirts give UPF 50+ sun protection. Apply sunscreen to exposed skin and give them a wide brimmed hat for more protection. You love the water and the outdoors. It’s an important part of your life. Help your children enjoy that same love and passion. And help them learn to do it safely.